Birds 'shout' to be heard over the noise produced by man-made activity, new research has shown. The innovative study, led by an expert from the University of Exeter, looked at how bluebirds altered their songs in response to increases in nearby background noise caused, in many cases, by human activities such as traffic. It found that the birds altered their songs immediately after noise levels intensified, making 'real-time' adjustments in order to produce songs that are both louder and lower-pitched. The results suggest that birds are able to perceive increases in noise and respond accordingly - not unlike humans do when in raucous settings. Dr Caitlin Kight, a behavioural ecologist based at the University of Exeter's Penryn Campus in Cornwall, led the study. Dr Kight said that the research could help improve our understanding of environmental constraints on animal communication, as well as enhance our awareness of what sorts of human modifications can impact animals, and how we might be able to reduce any negative effects of these disturbances. Dr Kight said: "Although many manmade noise regimes are often very different from those found in nature, there can be surprising similarities in certain features, including volume, pitch, or timing. Sounds caused by traffic, for example, may not be hugely different from those produced by waterfalls or heavy winds. Animals that evolved in habitats with those natural features may therefore already have, within their existing repertoires of behaviours, the flexibility to respond to noise pollution. This certainly seems to be the case with bluebirds." Although it has previously been shown that birds in noisier areas tend to sing differently than those in quieter surrounds, it was not immediately clear whether birds were able to make vocal adjustments in real time - that is, an immediate shift in response to increased noise made by a passing car, for example. Real-time modifications have now been observed in five different avian species. The current study is the first to describe this behaviour in a member of the thrush family. Dr Kight recorded songs produced by 32 male bluebirds, and analysed two from each male - those produced during the quietest and loudest period of ambient noise - to investigate whether males changes their songs between these two conditions. She found that, as background noise increased, male bluebirds produced songs that were louder and lower-pitched. This suggests that the birds are able to both perceive and respond to increases in noise. This enabled them to produce songs that were more likely to be heard by potential mates or rivals. Co-author Dr John Swaddle, from The College of William and Mary, in the United States, cautions against interpreting these findings as evidence that noise pollution has no adverse impacts on wild animals. Dr Swaddle said: "Unfortunately, the world is getting so noisy that even the most flexible of species will eventually reach a threshold beyond which they will have difficulty communicating—which will impact their ability to breed successfully. When we build roads and airports near human neighbourhoods, we employ noise abatement protocols in an effort to mitigate against the negative impacts of noise pollution. It is time to apply similar caution to conservation, management, and landscaping plans that impact wildlife and their habitats." 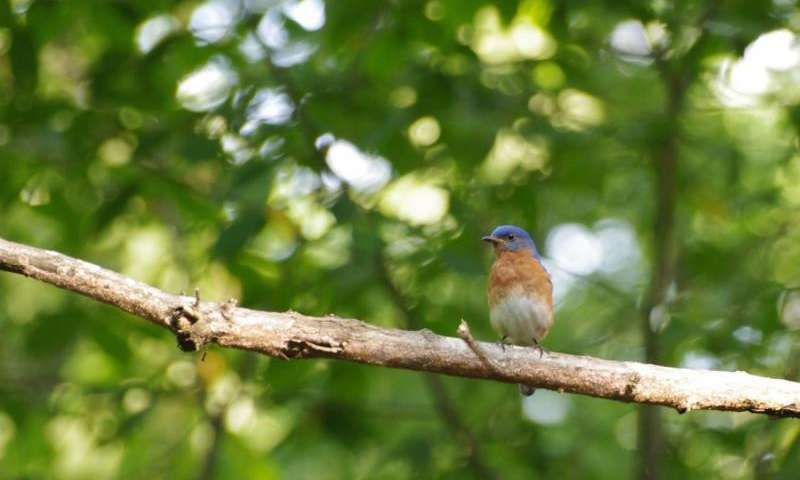 More information: The study, 'Eastern Bluebirds Alter their Song in Response to Anthropogenic Changes in the Acoustic Environment,' features in the leading scientific journal Integrative and Comparative Biology.